Hey hey y'all! How was everyone's Cup Weekend? I love a Tuesday public holiday! I spent the weekend in lovely Daylesford, where I got some much needed relaxation and enjoyed more than a few yummy bites! We stayed in Ablac Studio, a teeny-tiny but very comfortable cabin about 15 minutes out of town. It was so peaceful and relaxing! And it was very isolated - probably not the best idea to watch the scary Halloween episodes of all my favourite shows there, in the middle of the woods! 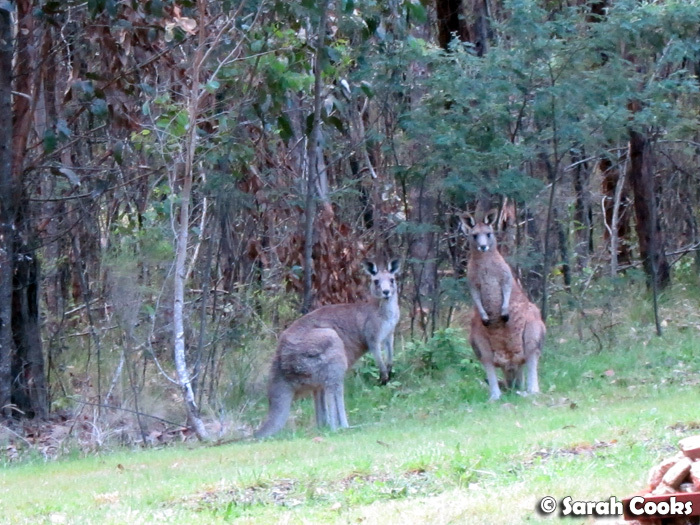 Yup, I totally squealed when I saw them! Kangaroos!!! You can see this guy was quite relaxed in our presence. And speaking of relaxing, the apartment had an outdoor bathtub! YAY!! 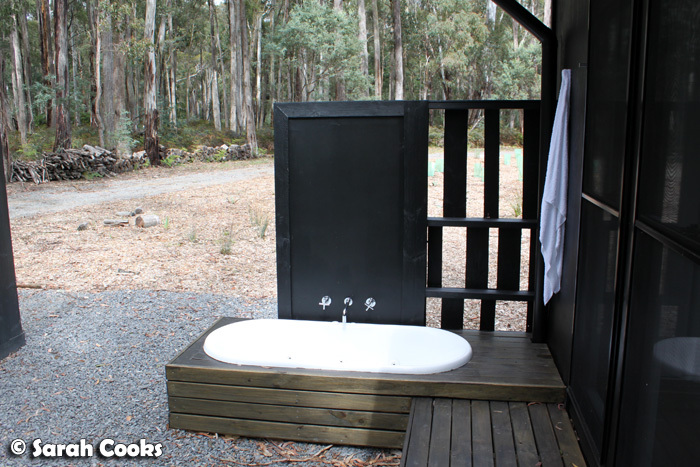 I think outdoor showers and baths are the height of luxury - private ones, of course - love them! (Remember the fabulous Breakas resort in Port Vila, Vanuatu?) I had a secret fear that the kangaroos would scare me out of the tub to use it for themselves, hehe, but luckily nothing of the sort happened. For today's post, I'd like to share with you some pictures and impressions of the different cafes and restaurants we visited on our trip. Prior to the trip, I sent out a twitter message asking for people's fave places to eat in Daylesford, and at least five different people responded very enthusiastically - Farmers Arms! It is a low-key and friendly pub with a wide range of meals in very generous portions. It didn't end up being quite as good as the recommendations had led me to expect, but still, it was a pleasant spot for a casual dinner. 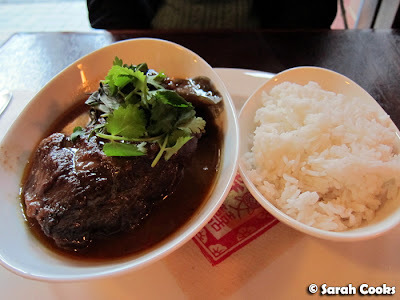 The beef cheek was very tender and the curry had a lovely flavour, but the dish overall was very fatty and rich - you can see a slick of oil on top in the above photo. 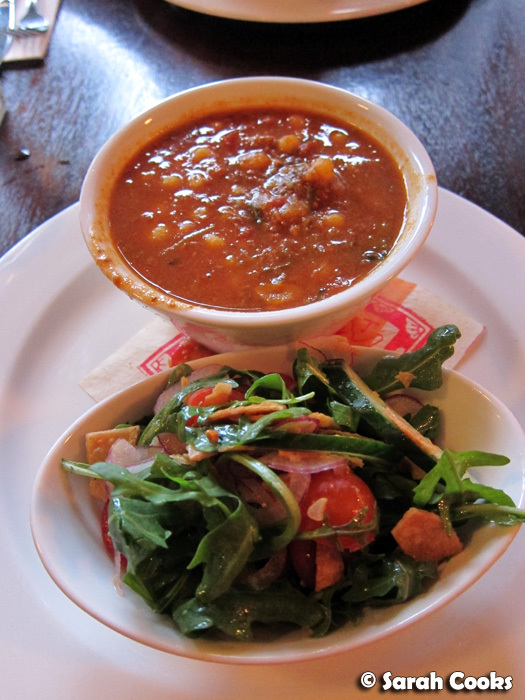 This richness was exacerbated by the huge portion size - there was easily enough for three people in that bowl! My Tunisian goat stew, on the other hand, was a much better choice - I enjoyed the freshness of the fattoush salad against the sweet, rich stew. 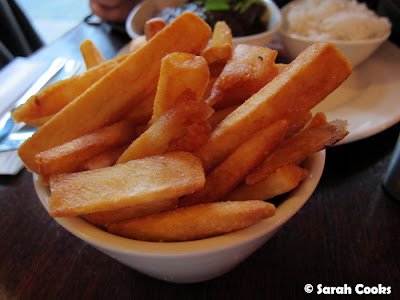 The chips we ordered weren't great, unfortunately: they'd clearly been sitting around for a while and fried again. I'd heard good things about their desserts, but we were extremely full so we didn't try any. Being a total spa-junkie, I was really looking forward to trying out some of the region's famous bath houses. 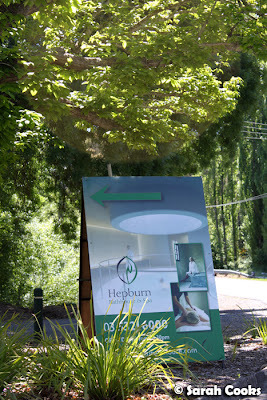 After much internet-research, we booked a "Sanctuary and Tea" package at the Hepburn Bathhouse, for $80 each. For this, we got two hours of bathing, plus Devonshire tea at the Pavillion Cafe. However, it was incredibly overpriced and a disappointing experience. The baths were uniformly cool at 36C, and the floors were rough and painful - ouch! Even the special features of the Sanctuary area weren't great: the "Spa Couches" were itchy and uncomfortable, the "Monsoon Shower" was more like a Trickle Shower, the "Aroma Steam Room" had no discernible aroma at all. Yes, it was relaxing, but nothing that you couldn't get in a spa at your local pool, and definitely not worth the price! I think we would have actually been much better off saving the $160 and putting it towards a nice meal instead. Oh well. In fact, the best thing about the bathing experience was the afternoon tea! 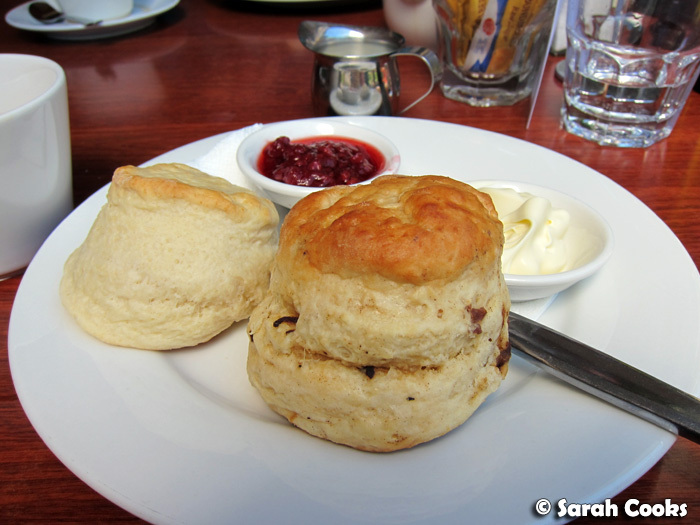 We each got two warm and fluffy scones, with double cream and local berry jam. I got one plain and one fruit scone, and Sandra got two plain. 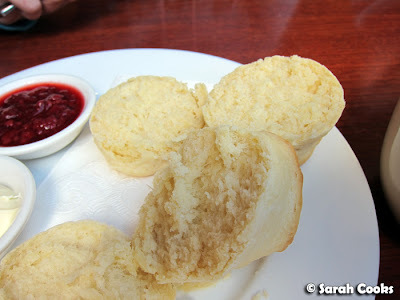 Here are the insides of the plain scones. Mmm... fluffy. The scones were really good, but for bathing I definitely prefer the Mornington Peninsula Hot Springs. To fuel up for the long drive home, we stopped in at Cliffy's Emporium. It's a cosy little cafe and food store, with an eclectic mix of decor. The soup contained cute mini-lentils, but had a rather odd taste - it was quite sweet, and had an overpowering spice flavour (I think it was fennel seeds). 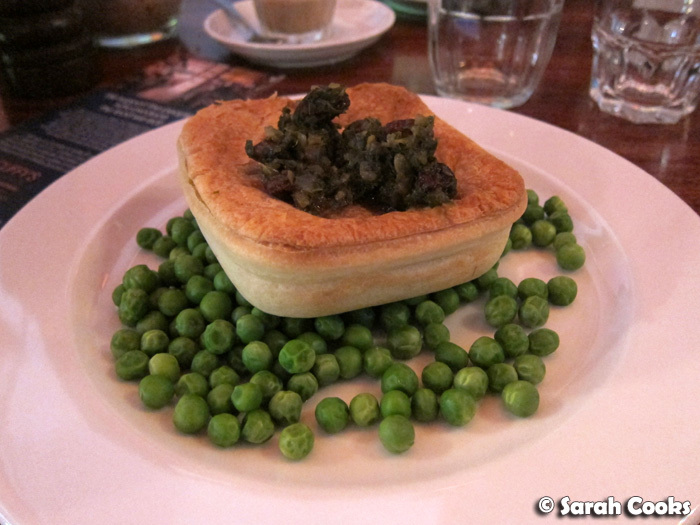 I loved the lamb pie! Tasty filling, flaky pastry, and a sharp mint relish. Gorgeous. They sell these pies frozen to take away, and if we weren't facing a 2-hour drive, I would have bought some to bring home. 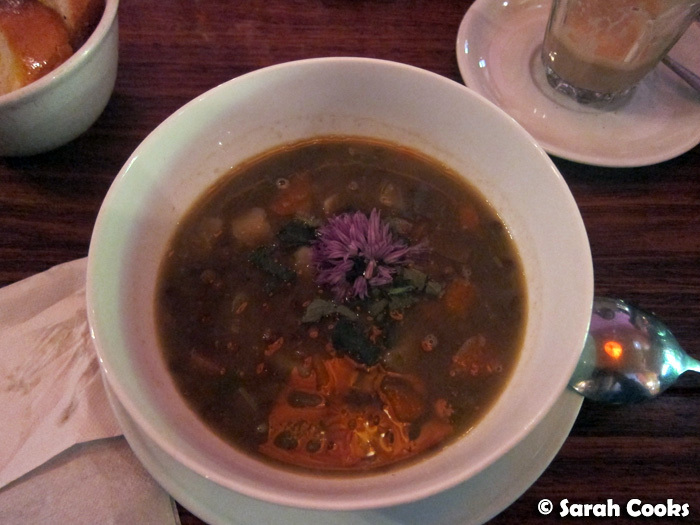 In addition to the above, we also visited Wombat Hill House Cafe and The Lake House (yay! ), which will each get their own blog post, coming soon. 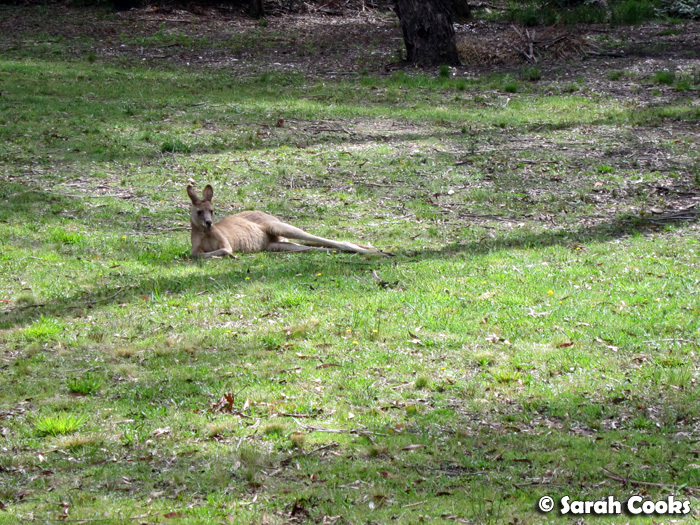 Overall it was a lovely relaxing weekend - I loved the fresh air and scenery, and all the locals we met were super nice! However, as you can see, we had a bit of a mixed bag of experiences when it came to the food and spas. Nothing was particularly bad or unsatisfactory, it was all just a bit "meh", especially for an area that's well known as a food and spa destination! I generally find it quite tricky picking good places to visit when planning a weekend away. I use a mix of Google, Twitter and personal recommendations, but of course there is no fool proof system. There also seem to be at least three Daylesford tourism websites (here, here and here) - a bit confusing! 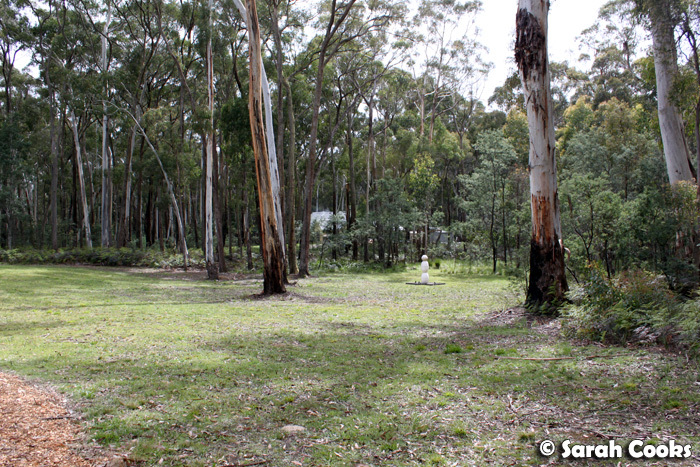 What are your favourite spots in regional Victoria? How do you plan and chose things to see, do and eat on weekends away? I don't think I've been to enough regions in Victoria to have a favourite. As for choosing them, my first start is usually that region's website, and then straight to blogs to read about each restaurant and hotel.